their catch, and to make a living. These are not professions to scoff at. I recently had the opportunity to dine with some of these great people and feast on their work at Post 390, during their kick off to their series- Farm to Post which concentrates on locally sourced products and showcases them in a variety of ways. 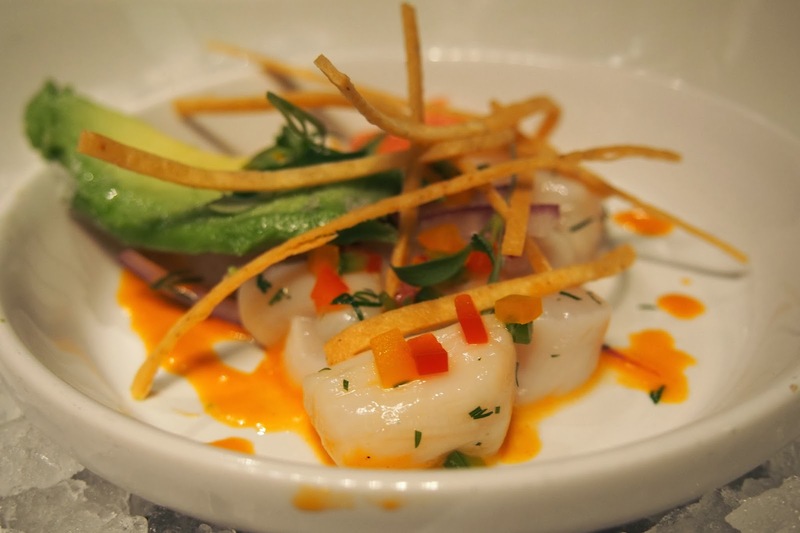 a Parsnip Vichyssoise, as well as a Nantucket Bay Scallop Ceviche paired with avocado and ruby red grapefruit. The oyster, poached full of flavor, was swimming in the thick Vichyssoise, which I adored was made out of Parsnips and gave it that very unique sweet, with just a hint of earth flavor. 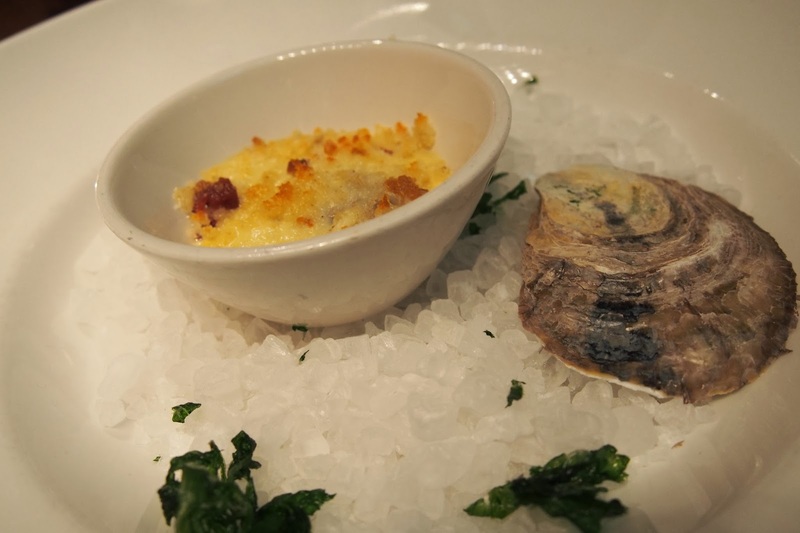 Together these were lovely, but then they were topped with a bacon and Gruyere cheese crumble which lent texture, and then of course those perfectly lovely flavors of smoke and salty cheese. The scallops were absolute perfection however. I adore the Nantucket Bay scallops, smaller than the general sea scallops I find that they are much sweeter and a bit more delicate- making them perfect to either lightly sear and caramelize the sugars or to serve raw in a ceviche as done here. Accented with rich, fatty avocado and the tart grapefruit the dish had the perfect mix of flavor components. Next we were served Stewed Holland Black Mussels in a traditional Portuguese style. 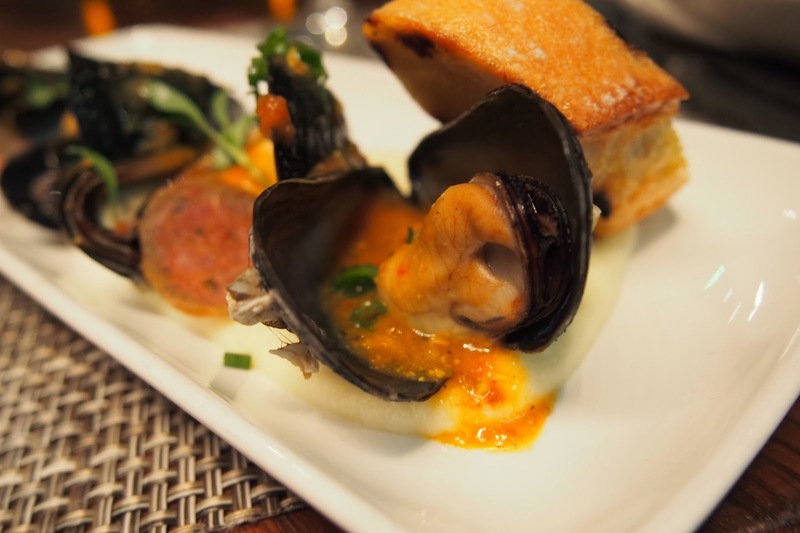 The mussels had been stewed in a tomato herb sauce, complete with house made chorizo, and served atop whipped potatoes. This was a wonderful modern twist on a traditional dish. Every flavor of the age old dish was represented, the spice, the fresh chorizo, the herbs and the acidic tomato, but was encapsulated in a cleaner, neater style. Of course, plating aside, the mussels themselves were delicious. Large and still containing their own natural flavors, they were a great representation of mussels sourced from Bar Harbor, Maine. Our next course was a Roasted Monkfish from the Gilnetter fishery in Newport, RI. 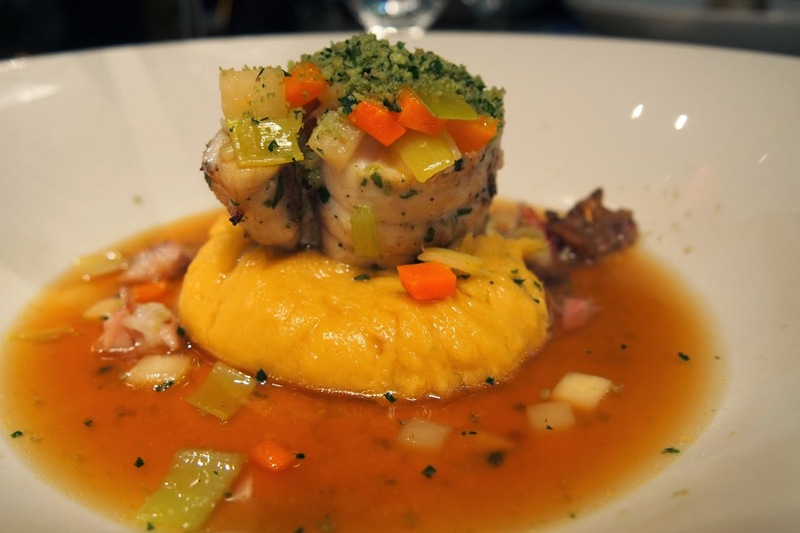 A thick piece of the white fish was placed atop a yellow split pea puree with a smoked ham hock bouillon with just a floater of sherry added for good measure. I adored this dish. I am a big fan of split pea soup as it was often made with the leftover ham hock from Christmas dinner when I was a child- this dish brought me back home. The Monkfish is a beefy fish, able to hold its own against the strong flavors of the ham and the sherry, and here it was cooked to perfection so each portion was light and flakey. It was topped with a gremolata of nuts and herbs which allowed for a great contrast of textures. Finally we were served a Skillet Seared Australis Farmed Barramundi, farmed from right here in Massachusetts in a little town known as Turner Falls. This farm has created the ability to house the great Barramundi fish that mimics their normal habitat in the Indo-West Pacific and source it locally. 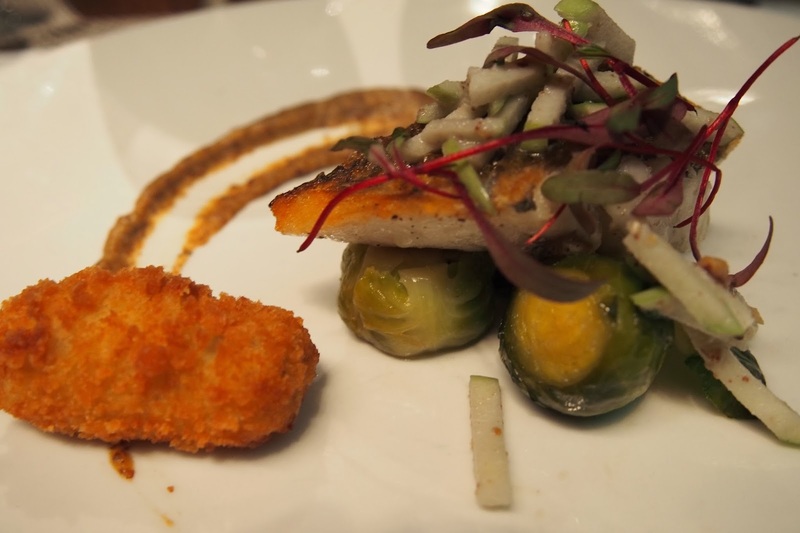 Here it was served with house-made Pancetta, Brussel Sprouts, a Barramundi tater tot and a house made cream ale mustard. The flavors resonating throughout this dish were incredible. Barramundi is another strong fish. It has good meaty qualities and can hold its own delicate flavors agains something like the mustard. The Panchetta added salty decadence and the brussel sprouts were in their roasted deliciousness glory. The real fun here, you could tell, was the excitement of the tater tot that chef had created as just a secondary way to show the depth of the fish. As our final course this was an extremely well prepared dish with well executed flavors in a playful and imaginative way. I love these dinners. 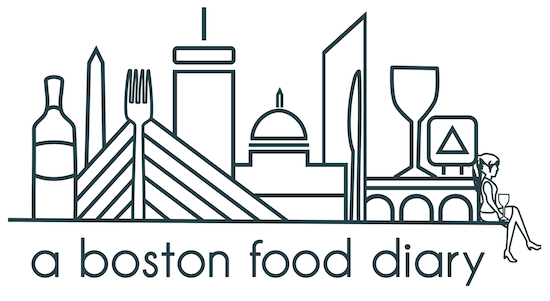 The ability for the chefs in Boston to showcase the beauty of our bounty around this area is incredible. Whether its a meal centered around locally sourced tomatoes, or showing off the unbelievable treasures of our oceans I am forever amazed. The seafood industry is one that has been incredibly important to our livelihood in New England since we began and the team at Post 390 did an incredible job of showcasing different offerings and introducing us to some incredible businesses.